What I'm Loving on Etsy - for Spring! Loose Parts / Build a Nest Activity - we make our own nests almost every year. It's a good hands-on learning activity for Spring. Bunch of Daffodils Card - I love the idea of using cards for art and why not use plant prints which celebrate the season. First Signs of Spring Print - these first signs of spring/summer/autumn/winter prints are brilliant, we have this one and we also have it in the card size, with the Spring flowers and garden bird cards too. They work so well in the child's space. Waldorf Spring Window Transparency - you know I love these for placing on the window, they are so beautiful. Bird Waterproof Apron (3-5yrs) - because Spring is the best time to get gardening and you'll need a Montessori Spring Apron. Fibonacci Petal Exploration Cards (download) - if you haven't taught your children about Fibonacci now is the time and what better way to start than with flowers!?! Flower Press - this is a nice reminder now that is the time to get out the flower press! Frog Lifecycle Wooden Puzzle - we have a favourite spot to watch for and monitor the frog lifecycle at our local nature reserve. There are no frog eggs there yet, but hopefully soon. This frog lifecycle puzzle is lovely and has a control of error. Frog Lifecycle Clay - wow, this is amazing, it would be wonderful in a classroom where it could be used and seen by many children. Floral Mini Mystery Bag - because floral fabric looks so lovely in the classroom or home at Spring. Wooden Memory Beneficial Bugs - memory games can be used as simple matching games and this one has a good learning theme. Flower Three Part Cards - a wonderful language tool for Spring. Since moving to the UK I've loved observing how those in Europe decorate their homes and children's spaces reflecting on the change in seasons and celebrations. I've loved observing European traditions especially at Christmas time! I've been seeing a lot of these cozy De Noest lamps and I couldn't resist their warm glow and ordered one for our home, it now sits on the children's shelves in our living area. It gets darks here really early, around 4pm, so having a lamp in this area adds a touch of warmth and light. Here are a few other Waldorf Style Christmas Decorations that I am loving. De Noest Lamp with Christmas Silhouette (Honeybee Toys in Australia has some De Noest Silhouettes and Lamp). Waldorf Window Stars in Christmas colours or to make Snowflakes! Christmas in the Woods Postcard - we display our postcards on a wooden photo/card holder or frame. De Noest Lamp with Sinterklaas Silhouette. Christmas Nativity Window Scene with Animals - we have one similar to this, they really come alive when placed on a window which allows the light to come through. Christmas Nativity Window Scene with Stars. Christmas Scene using Seasonal Table - this is a good idea and can be adapted using handmade figures or pictures, I love these seasonal tables, on my wishlist! My children are now on school holidays and we are planning to spend the next week doing lots of Christmas crafts. Can you guess what we will be making tomorrow inspired by this post? I will share with you if they work out! I hope you have lovely weekend. What I'm Loving, Buying and DIYing on Etsy. Today I'm sharing some of the handmade materials that I am loving, buying and DIYing on Etsy. Aren't these beautiful? Set of Eight Sun candleholders gradient-coloured. We have this one and I think it's a lovely alternative to the stacking rainbow. Wooden Stacking Sun. This is a sensory set for a treasure basket, I'm taking inspiration from this one to DIY and add some texture to Otto's baskets. Heuristic Play Baby Basket. Loving this, if it was in the EU I would order it immediately. Flower Paint Jar Holder. The only reason this one isn't in my cart is because I can't decide which one to order. These would look gorgeous on a seasonal or nature table in a cardholder or on simply on the window. Window image transparent picture. This illustrator also has fun cushion covers and insect and animal notepads. This animal tray would work well in any child's space. Animal Print Tray. So many of these are suitable for celebrating the summer months. This week we've also received a coloured world map wall sticker for Otis' room (the price is unreal). We haven't put it on the wall yet but so far it looks good. I'm also seriously considering some of these antique poster print wall charts for Otto's room, let me know if you have a favourite (I'm thinking the owl or bear). Coming to you from France! Can you believe we are currently on holidays in France? It's such a wonderful experience for the boys. They have French lessons in school but this is a real immersion into French culture. We just got back from the supermarket and it was so fun looking at all the different products, reading the different labels and greeting others in French. As we are in France, I wanted to highlight some wonderful materials from around this beautiful country, most of these are for infants or toddlers and all are handmade, some might inspire you to DIY. Not all of these are Montessori materials but they are all suitable for and relevant to a Montessori home environment. Montessori Baby Toys - Interlocking Discs, Bell Cylinder and Grasping Beads. Organic Cotton Natural Infant Kimono Top - pure unbleached clothing for infants, the most gentle clothing. Child's Cotton Cleaning Cloths - in the sweetest fabric. Montessori School Inspiration France - écoles de Montessori France. 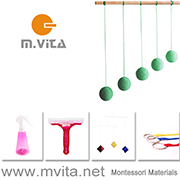 matériaux de Montessori de France - Montessori materials from France. What I'm Loving, Buying and DIYing on Etsy! There are so many good and inspiring materials available on Etsy. It's easy to find natural learning and Montessori style activities for your children. I often find ideas on Etsy that I can DIY or gift ideas that I can put away for later. Best of all these materials are made by hand often by teachers or parents. Here are a few Etsy finds that I am loving, buying and DIYing! 1. Children's Ornithology, Naturalist, Nature Study, Loose Parts Kit - This would be a great way to start a nature table or bird/egg/nest themed exploration area with lots of basic pieces. There are small parts though so I would recommend for preschoolers (not toddlers). I love that this comes neatly packed in its own container too. 2. Ceramic Milk Jug - There is something about the polka-dots that tells me this needs to be a children's kitchen. As a water or milk jug (how lovely for the breakfast table) or even as a vase, it's perfect! 3. Nature Stamps - This seller has a whole series of gorgeous nature-based stamps, I love the squirrels but also the badgers and the bees. It's also useful that you can order various coloured stamp pads from the same seller. 4. Photographs of Nature Items including Seedpods and Fungi - These are lovely, photographs of interesting and beautiful nature items. I've spoken to the seller and she is aiming to make some of these nature photographs available in a digital file, which would be useful for international buyers who can then download and print. 5. Tidepool Invitation to Play/Loose Parts - This concept is excellent, it contains photographs of real and interesting items found in nature (the tidepool) plus lots of nature items such as shells and loose parts like model animals (from the tidepool). I wish this was local to me as I would order it ASAP (they don't ship to UK) so I'm going to DIY this, Otis will love it so much! 6. Toddler Lock Box - Lock boxes are great for children starting around the 18-month to two years mark. This one has lovely, simple design that will keep those little hands busy. 7. Shapes Puzzle - This arrived yesterday and it's beautiful. It's a little smaller than I expected but the wood grain is stunning. I ordered a few items from this store and they are all finished so smooth with the same beautiful wood grain. I'd suggest this puzzle from 12 months+. 8. Geoboard for Toddlers - I love this for learning basic shapes, it's nice and simple with a 3x3 peg design. Geoboards are so versatile, an older child could make more complex shapes, small pictures or scenes or even letters of the alphabet. 9. Little Wood Pot with Lid - This little pot is so useful I wish I had more. Perfect for storing little items on your Montessori trays such as little beads, postage stamps, rubber bands for your geoboard, small items for pasting and more. You can see the same little pot used on a pasting tray by Otis at two years here. There are a few stores that sell these so it's worth looking around. 10. Children's Fruit and Vegetable Cutter - I was skeptical about this, we've always used a metal crinkle cutter, but it has all five-star reviews and parents are commenting that their children can use it to cut fruit and vegetables. I've ordered it to give it a try, worst case scenario it would be good to use with playdough. The international shipping on this was reasonable. 11. Toddler Spirograph Set - Seriously! How cute is this? It would be so good (and perhaps a little challenging) for their fine and gross motor skills. On my wishlist now. 12. Farm Animal Memory Game - These are super sweet with clear images of farm animals. For matching, playing memory or perhaps put magnets on the back or for storytelling. I hope you've enjoyed this round-up. If you are an Etsy seller or have something you would recommend, please feel free to share and leave a link in the comments. I often shop on Etsy for my children, sometimes for clothes sometimes for learning materials. It is filled with ideas and inspiration. Here are a few things on my wishlist for little nature lovers. Kids Organic Birds T-shirt - Otis has a bug shirt by this company and he wore it for many years. I've ordered a new bug and this bird shirt for Otto, they are adorable. Plant These to Help Save the Bees Tote - I love everything in Hannah Rosengren's store! The tote would be lovely to take on a nature walk or to the farmers market! Bee and Flower Sticker Set - includes honeybees, bumblebees and, flowers known to attract them. We saw our first bumblebees this week and they are so cute and fluffy! My kids love to use stickers and this feels like a great way to learn about bees, flowers and, pollination. Frog Lifecycle Story Rocks - We've been observing the frog life cycle at a small pond at our local nature reserve, it's the first time we've seen a complete lifecycle in nature, in person. As my boys have been attending forest school (once a week) I have a new appreciation for learning outside and using more natural materials. These realistic drawing on rocks are ideal for this type frog work. Wouldn't it be fun to have the children make their own lifecycle story stones, no plastic models needed! Tide Pool Layered Puzzle - This has so much detail and contains five tide zone layers. Educational Feather Collection - this is a collection which can include labeled (common and scientific name) feathers would be lovely for an at home collection or for a school setting. While we collect a lot of feathers it's nice to have different types to study and they always look fantastic on display! A few other things I'm loving include this Amazing Earthworm Poster, Woodland Enamel Mugs (I just ordered one, couldn't resist), Bee Temporary Tattoos and this Life is Beautiful poster. Please feel free to share your latest Montessori or nature loving finds on Etsy. Fox Bowl - A real ceramic bowl, perhaps to share some Christmas treats. Children's Christmas Montessori Apron. For baking with my little ones, perhaps some gingerbread? Children's Christmas Placemats - Need these, they are so cute and can be reused every year! Christmas Pure Beeswax Candles - These are beautiful. I find candles often bring people together. Reindeer Rattle/Grasper - For the littlest hands. Christmas Tree Cot Sheets - Perfect for the floor bed. Baby Christmas Clothes - Easy wearing Christmas clothes, I love this brand! For Christmas I've ordered this sweet bird rattle for Otto, hope he likes it! Have you started to decorate for Christmas? Rainbow Mini Playsilks - These are 11 inches square. We had a couple of mini playsilks when Otis was little and they were so useful. I've found the larger playsilks are too big and infant can get lost in them. These are good for hanging from a playgym, playing peek-a-boo and for the child's first sensory basket. Puzzle Ball - These are not at all easy to make. I made one for Otis but I'm seriously considering ordering one this time. These come in different sizes which is nice. In addition to grasping these can also be hung from a playgym or from an overhead hook for the infant to kick or bat at, consider putting a bell in it for an additional effect. The balls pictured have excellent international shipping. If you are willing to pay a little extra (depending on your location) this store in Canada has a lovely selection. Grasping beads - These are a nice take on the traditional Montessori grasping beads (and also a possible DIY for the boys). The smaller beads would be easier for the infant to grasp. Montessori Rattle (to suspend) - I adore this store but because it's located in France (and international shipping is high) I'm going to DIY this rattle, or similar inspired by this rattle, with help from the boys. I've sourced the bells, wooden ring and beads from Spotlight and Riot Art and Craft Store, I'll post some pictures when we have finished. I just love that this can be personalised and the boys can add their own unique touches. I'm also looking out for other interesting materials that we can hang on the playgym such as rattles and balls. Wooden Playgym - As we are moving we won't be suspending any tactile mobiles in our home. In the past, we've used secured hooks in the ceiling (our visual mobiles are suspended on a temporary hook which can be easily removed). As we don't want to repair the damage for such a short-term gain I'm thinking of using a playgym for tactile mobiles (those the child is encouraged to touch, bat, and pull on such as bell or ring on a ribbon). I want something safe, I know this can be DIYed but for the cost, I'll probably go for one similar to the one pictured or this more traditional type (which is almost local to me). Meg has a good tutorial here. There is also a nice tutorial for a similar baby gym at Reading My Tea Leaves. My two older boys are back at school tomorrow and I'll be at home alone for the first time with Otto, it's currently raining here so it will be nice and cozy. This week I'm aiming to make all of our dinners vegan, wish me luck! I hope you have a great week. Natural Etsy Finds + Midweek Montessori Reading. I love buying materials from Etsy. Especially when preparing for a new baby I like to buy local and handmade. This week I've ordered and received playmats, rattles and infant clothing from Etsy, all which have been fantastic quality. Here are a few materials for a Montessori home that I'm loving! I've recently ordered some (commercially available) baby clothing and I can't believe how much blue I've (subconsciously) bought, so I'm making an effort to balance this out with some gender neutral and handmade clothing from Etsy. I love this gender neutral dinosaur tee. Natural playdough stamps. This has given me lots of ideas on how we can DIY our own stamps! Natural linen futon. I'm loving this idea for a reading corner, with an infant they could lie here while the boys read to them, or it's just a nice way to get boys comfortably on the floor at the infant's level. A deluxe nature explorer kit - this would be a wonderful birthday present. So many pieces in this nature study box. I love how they have included images and photographs. How about some midweek Montessori reading? Here are a few articles that I am enjoying! OMG I'm An Accidental Montessori Parent and Here's How It Happened at Romper. There is so much more to Montessori than shelves and materials at Every Star is Different. More home tours from The Montessori Notebook, you can see our home tour here. If you are interested in Montessori playgroups you might enjoy this interview, Meet Ananda Montessori at The Prepared Environment. Montessori in Small Spaces at Diamond Montessori. Guiding the Gratitude Mindset: How Adults Can Shape Children's Capacity for Appreciation at Chesapeake Montessori School. So much good advice. Montessori home environments can all looks so, so different, there is lots of ideas and information here at Arc Montessori. What I'm Loving (and Buying) on Etsy This Week! These are not traditional Montessori materials but are all suitable for a Montessori home! These materials have lots of colour and texture for the child to explore! Pikler Climbing Set - This is a large climbing set however individual pieces are also available. Perfect for the infant who needs to climb, possibly before they are even walking! 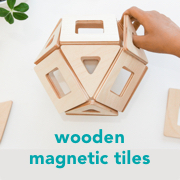 I've seen these in so many Montessori homes, they are on my wish list! Sensory Grasping Beads - So similar to the Montessori grasping beads but with the texture of crochet and lots of colour! Large Playmat - This store has the sweetest playmats! Perfect for a movement area, next to a wall mirror or for under a Montessori mobile. Crochet Sensory Ball - I've ordered this one today! A lovely texture for the infant. Crochet Veggies - This store has our favourite crochet eggs too, a wonderful texture for the child to explore with their hands, put them in a sensory or treasure basket. Rainbow Blanket/Playmat - On my wish list. Playmats or a soft movement area are essential for a Montessori baby, a folded blanket or rug does nicely, not too hard not too soft. I've loving the colours on this one! I've only ordered one thing from Etsy this week, but I've done a lot of looking around. I'm constantly drawn to handmade products and often to the textures of materials like wool and timber. Here are a few sweet wooden finds on Etsy that are suitable for a Montessori home, a couple of these puzzles (like the animal tracks puzzle) could work well in a classroom environment too! Short to Tall Sensorial Puzzle - This is so similar to the Short Tall Knob Puzzle which we've used in our home, but this one is a lovely natural (unpainted) timber. Animal Tracks Wooden Puzzle - I also love this wooden build a mushroom kit by the same maker. Butterfly Life-Cycle Puzzle - I've been seeing this puzzle everywhere! Natural Wooden Stacking Toy - I wouldn't give this to a child who is still mouthing things but I absolutely love the texture! This ships international for free. It also has lots of different timbers which is useful for nature study. Montessori Stacking Toy - Forget plastic stacking toys! This stacker is similar to the one above but it is really smooth. Wooden Ocean Puzzle Set - Includes the Coral Reef and Ocean Animals. This is more of a Waldorf toy but it's adorable! It's a puzzle but useful for pretend play. Natural Wooden Sorting Tray - Also by the same maker large tree/wood cookies, perfect for the nature table, nature/tree study or for beautiful displays, Australian made. My children are now on school holidays and we are hoping to do a lot of baking this weekend, I'll save and share any recipes that work well for us! I hope you have a great weekend!